The internet is a real savior sometimes. 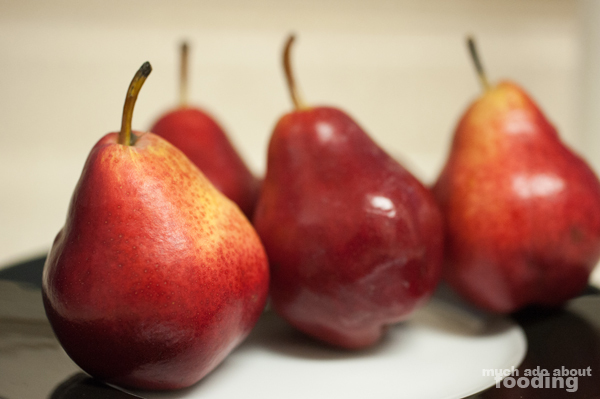 We had bought Red Anjou pears (incorrectly labeled as Forelle at the store) to use as a Test Kitchen ingredient a few weeks prior before realizing that it was going to be foregone due to OC Restaurant Week posts. It got to the point where the pears were going to go bad unless I made something so I looked around for ways to use pears. Lo and behold - tart recipes! After much data collection, here was the tart I put together. I had decided to leave the skin on my pears because I like the extra nutrients from them. You'll have to slice your pears into approximately 1/4" slices. Butter a 9" pie dish well and then layer all the pear slices. Preheat oven at 350°. To melt my butter, I placed the 1/4 cup in a oven-safe measuring cup and let it melt while the oven was preheating. In a food processor or a blender, combine butter, eggs, cream, salt, sugar, flour, and vanilla extract. Blend thoroughly before pouring over pears in the pie dish. Place pie dish into oven for 35-40 minutes. The longer you leave it in, the more cooked the custard will become so the texture is up to your preference. Remove from the heat once finished and let cool before slicing and serving. I topped ours with a little bit of cinnamon on top but you can also use powdered sugar or perhaps even ice cream? I thought it tasted even better after we had let it sit in the fridge for a day - mmm cold custardy pie. Enjoy! I'm looking forward to using this beautiful blend which has a mix of salt, onion powders, and minced green onion. It seems fairly basic and very versatile but I'd like to get a sense of what you think I should do with it. What kinds of recipes do you want to see up? Tell me on Facebook! Giveaway - Cooking Planit Spice Giveaway LIVE!